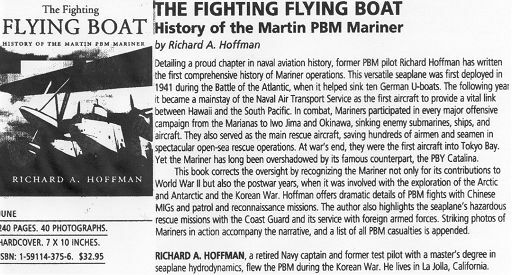 BOOKs: Title: The Fighting Flying Boat: A History of the Martin PBM Mariner by Richard Alden Hoffman dickdot@san.rr.com. Squadrons, Tenders, etc. include: VP-13, VP-16, VP-17, VP-19, VP-20, VP-21, VP-22, VP-25, VP-26, VP-27, VP-28, VP-32, VP-55, VP-56, VP-73, VP-74, VP-98, VP-100, VP-104, VP-111, VP-117, VP-119, VP-120, VP-201, VP-202, VP-203, VP-204, VP-205, VP-207, VP-208, VP-209, VP-210, VP-211, VP-212, VP-213, VP-216, VH-1, VH-3, VH-4, FAW-3, FAW-5, FAW-9, FAW-11, FAW-12, FAW-16, USS Albemarle (AV-5), USS Pocomoke (AV-9), USS Casco (AVP-12), USS Chincoteague (AVP-24), USS Pocomoke (AV-9), and USS Chandeleur (AV-10).